The term 'Bahri Mamluk' means 'river slave'; this dynasty were soldier-slaves stationed on Roda island in Cairo when their leaders seized power after the fall of the Ayyubids. This period saw much factional struggle and political instability, but despite this, certain sultans found the resources to undertake large-scale building projects. Al-Mansur Qalawun (1279-1290) and his son al-Nasir Mohammed ibn Qalawun (1310-41) were two such rulers. Their great complexes are situated in the area called Bayn al-Qasrayn ('between the two palaces') on Sharia al-Muizz li-Din, near Khan al-Khalili. The Madrasa, Mausoleum and Maristan (hospital) of Qalawun was built in 1279 and has been under repair since the 1992 earthquake. Despite the scaffolding this fabulous building is worth seeing. Also in Bayn al-Qasrayn are the Mausoleum of al-Nasir Mohammed, built in 1304, and a complex of the Circassian sultan Barquq. It is actually al-Nasir's son who is buried in his mausoleum; note the Gothic entrance, taken from a church in Akko during the Crusades. This ruler also built the only surviving Mamluk structure in the Citadel, a mosque dating from 1318, and a huge aqueduct to supply the Citadel with water which runs all the way to the Nile and still stands today. During the fourteenth and fifteenth centuries the heart of the city shifted south to the area called Darb al-Ahmar ('the red road') to the south and east of Bab Zuweila. Two of the earliest buildings on the Darb al-Ahmar are the Mosque of Maridani (1339) and the so-called Blue Mosque (1347), more properly called al-Aqsunqur. The earlier building features large re-used Pharaonic columns. The Blue Mosque gets its nickname from the covering of blue floral tiles on the walls. These were added to the building in 1652 and are in the style of ceramics manufactured in Iznik in Turkey, although the quality suggests they are provincial imitations, possibly from Damascus. Also on the Darb al-Ahmar is the later Mosque of Qijmas al-Ishaqi, built in 1481 during the reign of the Circassian Mamluks. 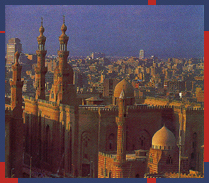 Next door to the Citadel is the enormous Mosque and Madrasa of Sultan Hassan, built between 1356 and 1363. This huge edifice was paid for out of the savings of victims of the Black Death that reverted to the state. The Sultan, who did not see the finished building, placed his own mausoleum behind the Mihrab (the niche facing Mecca), thus controversially making himself the recipient of the congregation's prayers. This building is one of the finest examples of Mamluk architecture, and even better appreciated if one can find a moment between tour parties. The other huge building opposite is a nineteenth-century building in Mamluk style called the Mosque of al-Rifai. Some of Egypt's royal family, including Farouk, are buried here.